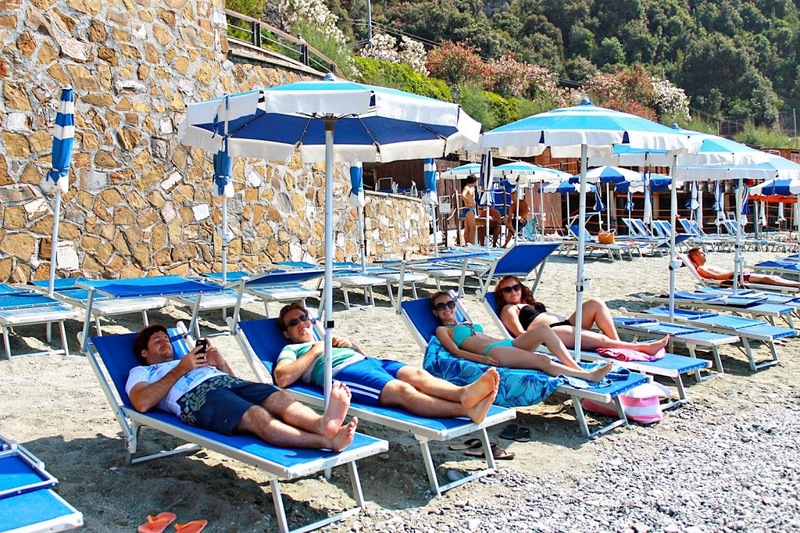 Picture this: It’s June or July and you’re on the trip of a lifetime in Italy. You’ve been to Rome and seen all the architecture, you’ve been to Florence and seen all the art, but by this point it’s hot and if you have to go to another museum with no air conditioning you might just get a heatstroke. So what do you do? As Jaime constantly reminds me, Italy is basically a peninsula of culture, a lifetime is not enough to see every museum with artifacts, architecture, and art that showcases some of the best aspects of human history. But I’m also human and sometimes I just want to go somewhere where there’s not much to do except lay around, drink a cold alcoholic beverage, and soak in the prettiness. Is there anything wrong with that? 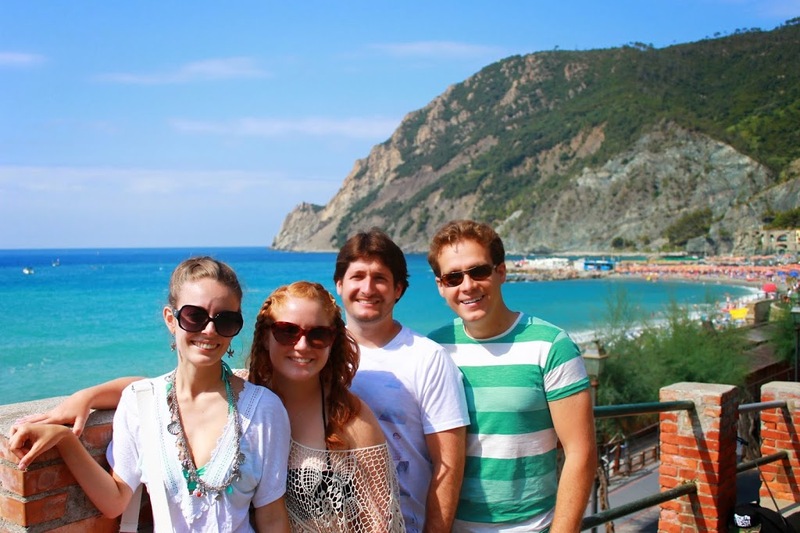 Where I’m going with this is that if you’re looking for just pretty, look no further than Cinque Terre. I’ve been dying to share our pictures with you guys. 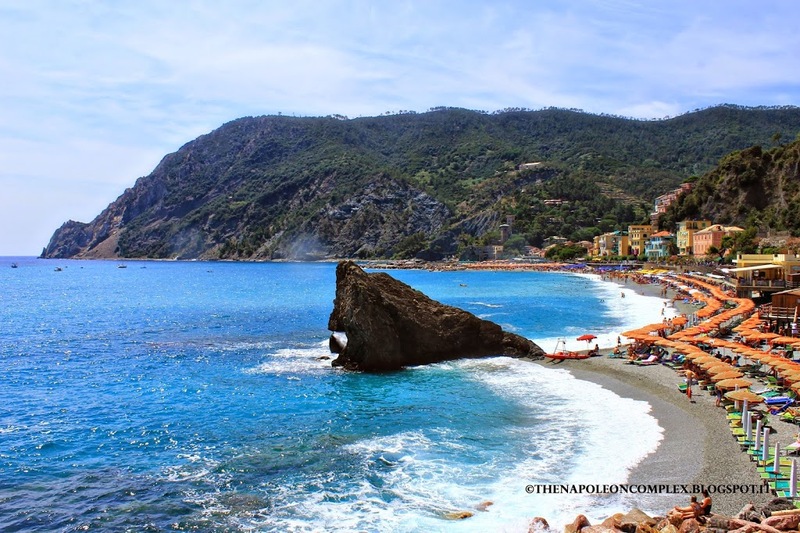 Cinque Terre is made up of five villages in the Ligurian coast: Monterosso al Mare, Vernazza, Corniglia, Manarola, and Riomaggiore. 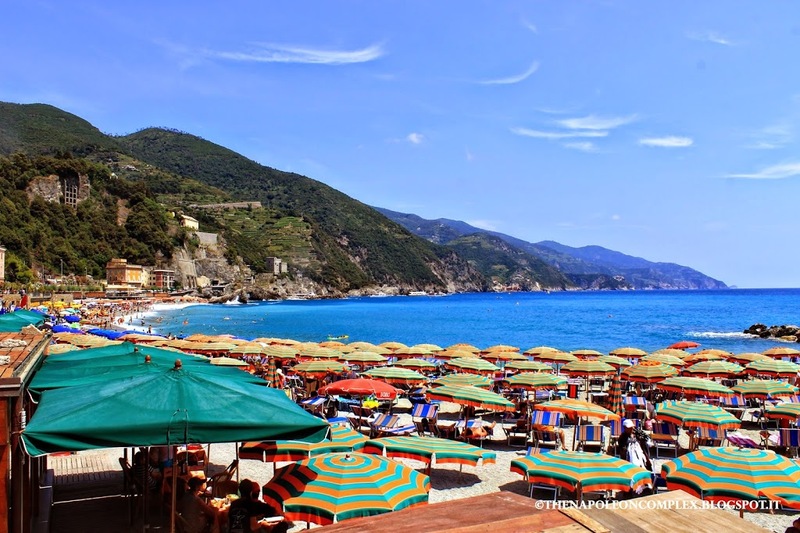 After our 24 hours in Milan, we spent the weekend exploring Cinque Terre, visiting Monterosso and Vernazza one day and Manarola and Riomaggiore the next day. Unfortunately we just didn’t have the time to visit Corniglia, but there’s always next time, at least for Jaime and I :). 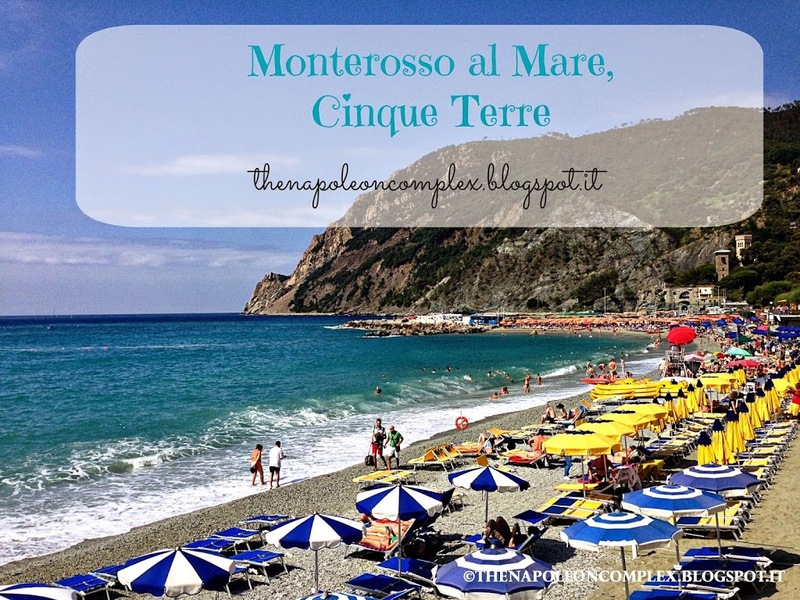 Today, I’m going to share our pictures of our day in Monterosso, the village with the most extensive sand beach in Cinque Terre. The beach was great, the water was very blue, but very deep, and the sand was not fine, but pebbly. Regardless we had a great time, and Carolina and I had the best fresh fruit cocktails I’ve ever had. I’ve spent the past 15 minutes looking for the name of the place, but I can’t find it anywhere. Then I looked in Google Earth and found the place but it doesn’t even have a name. I don’t think you can miss it though, because it’s beach front and advertises its fresh cocktails all over the place. It’s also next to a pharmacy, if that helps. This is your first view right off the train station! 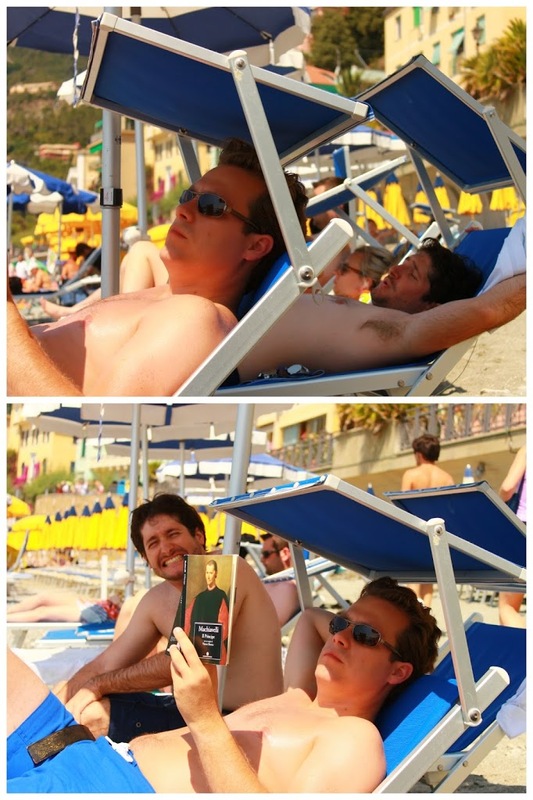 Well, except for Jaime, who reads Machiavelli’s The Prince…in Italian! 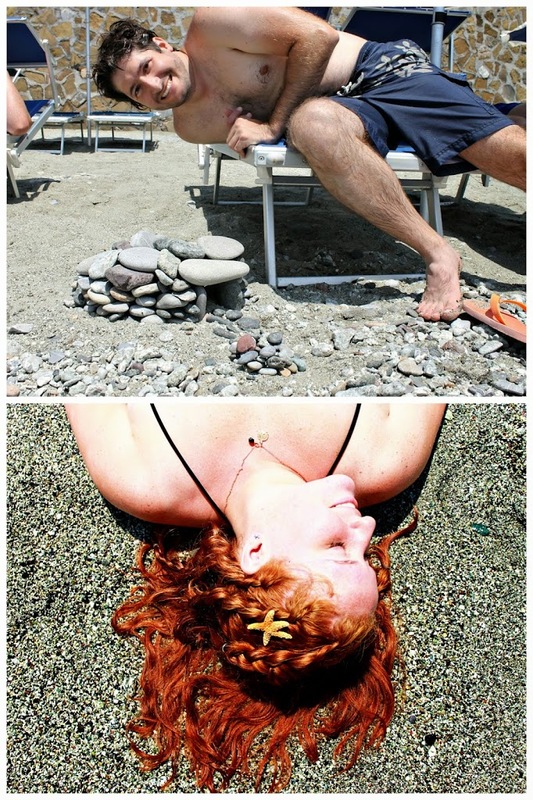 One of my favorite pictures of the day: Carolina’s hair against the sand. Yes, it’s that red. 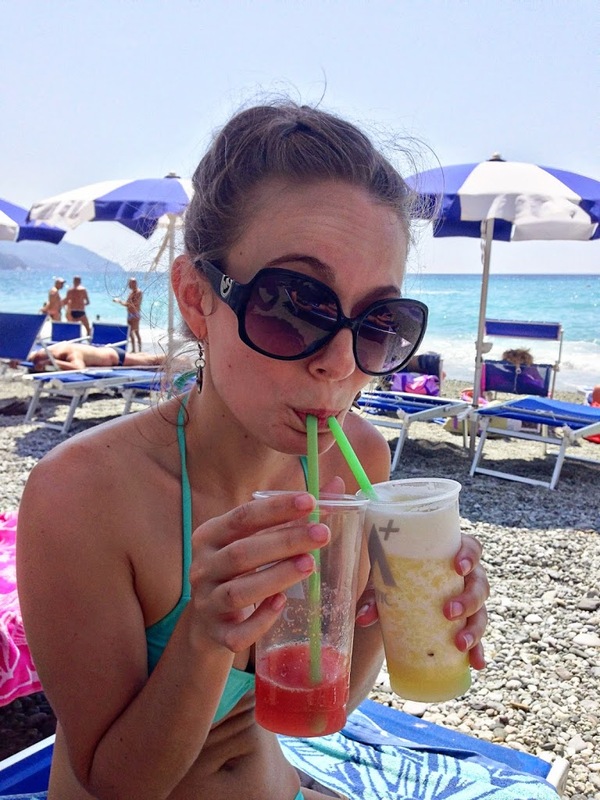 Strawberry Daiquiri & Piña Coladas: the best ever! 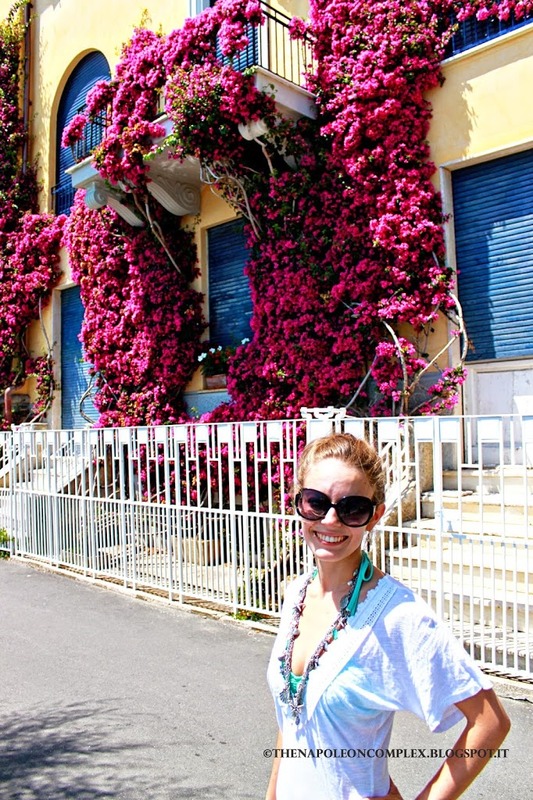 I’m obsessed with bougainvillea and in Monterosso they were everywhere! Stay tuned for the rest of the villages’ posts later on this week!